A couple of months back a photo similar to this one was posted on Twitter. The caption said that the view only works in winter when there are no leaves on the trees. This is true, but perhaps the main reason the view is so striking now is because trees which used to occupy this site – to the left, by De Grey House – were cut down, and remaining trees have had branches removed. The application to fell two redwood trees between the De Grey Rooms and the theatre was submitted in autumn 2011, as mentioned on this site. There were no objections. It’s interesting how some trees are valued and fought for, and some disappear and we barely notice. If they don’t actually disappear they’re rarely left untouched in our cities. They’ll have their crowns thinned, lifted. Trees don’t need to be pruned, we prune them to make them fit better around our buildings. Looking at that photo above, it could be argued that the trees remaining look a bit unbalanced now, with all that crown thinning/lifting. Those long spindly trunks with the branches starting too high up. Like so many town trees. 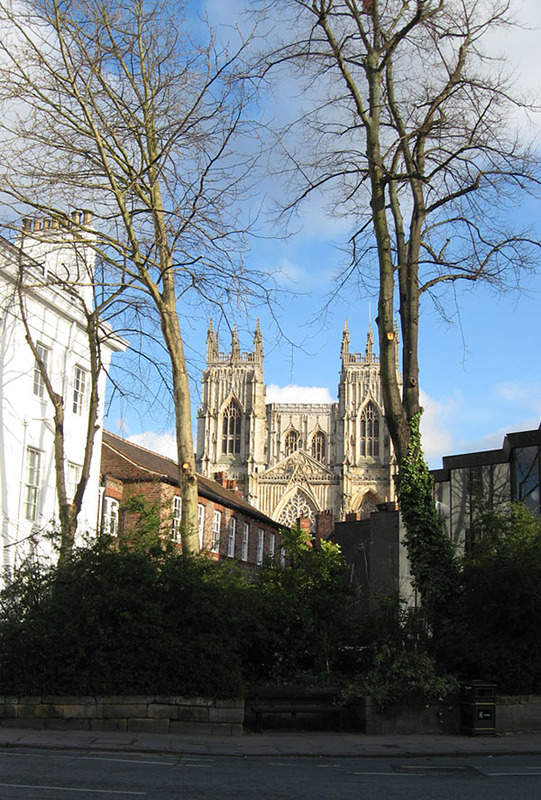 Despite all this removal and pruning the remaining trees are still partly obscuring a view of the Minster. Perhaps we should remove them altogether? It’s not a great view – personally I think the Minster looks a bit odd and squat from this angle. But for years I’ve passed along St Leonard’s Place and admired the striking contrast of the modern (1960s) extension to the Theatre Royal with York Minster visible behind. Somewhere, though I can’t find them, are photos attempting to capture that architectural contrast: the dark, sleek modernity of the theatre foyer and the ancient sunlit stone beyond it. It never really worked as the trees obscured most of the Minster, leaving only glimpses through branches. I took the photo above, more recently, from the pavement opposite, outside the old council offices, now vacated. Soon to become a hotel. An added allure, no doubt, would be if it had a clear view of the Minster from that end of the building. So perhaps, in due course, there will be another application to remove the remaining trees entirely. Or keep ‘lifting’ and thinning their crowns. In densely built-up central York there’s very little room for mature trees. Those remaining are often removed because of fears over safety, if they show any signs of disease. Even those in robust health can be removed for questionable reasons. As in Kings Square. More on that story later.